Barn Hunt is one of the fastest growing dog sports in North America, and PEAA was the first club in Alberta to host a sanctioned trial in November 2015. 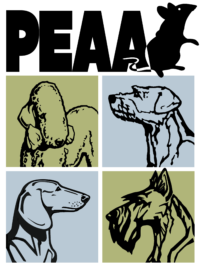 Both purebred and mixed breed dogs are allowed to compete, all they need is a Barn Hunt number which can be easily obtained by going to the Barn Hunt Association website here. A full set of rules is also available on their website along with a listing of upcoming Barn Hunt events such as trials, fun tests, and workshops. At this time, PEAA does not hold any Barn Hunt practices, however we do host at least one Barn Hunt trial per year in the Calgary area. You can check our website for upcoming trials, or join our Barn Hunt Facebook page here. There are several other established clubs in Alberta that host Barn Hunt events; you can find some of them on the Barn Hunt Alberta Facebook page here. If you are looking to try this sport and would like to find a place to practice with experienced competitors, there are a few options around Calgary.